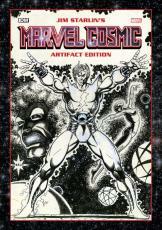 Jim Starlin was one of the driving creative forces at Marvel Comics in the 1970s and 80s. His turns on Warlock, Captain Marvel, and others have laid the groundwork for much of the Marvel Universe for decades. This Artifact Edition will include beautiful pages that have been scanned from the original art, including many rare and historical examples. This is definitely a book any Jim Starlin fan will want in their library.